At the bottom of the post you will find more ideas for how you could use this activity to suit your child and/or learning objectives. Alternatively you can leave it as the inviting open-ended activity that it is and leave it up the kids to see where they will take it. Either way, it's just simple, fun, play and learning. - Simplify this activity by allowing younger children to press and poke the pasta into the playdough. Just picking up the pasta and sticking it into the playdough is great for their fine motor skills and hand-eye-coordination. 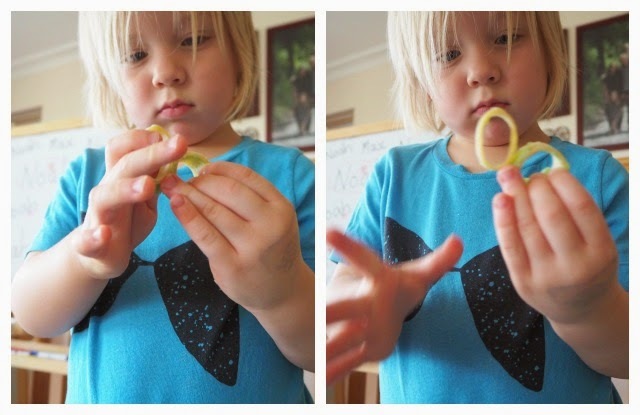 Squeezing, rolling and manipulating the playdough is great to strengthen hand muscles and you can also introduce some basic counting by counting out small groups of pasta pieces. Having the children first draw a design and then attempt to replicate. If any, what issues/problems did they have? How could they be solved? Using it to focus on patterning with children. Use the pasta pieces stuck in or imprinted in the playdough to demonstrate different patterns. - We used this playdough recipe. It's the one we use in all our activities and is a favourite because it's quick and easy to make and lasts for months. 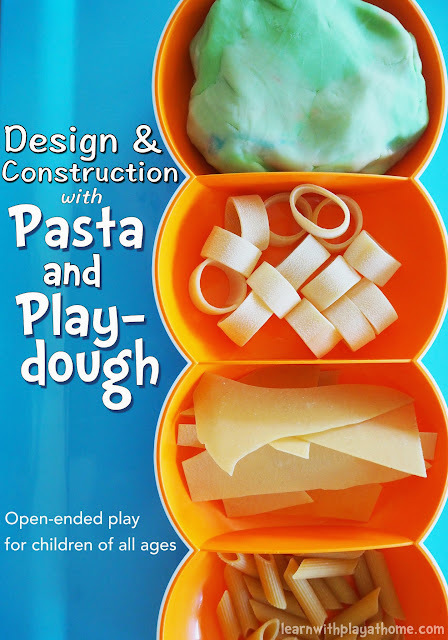 - Instead of pairing your playdough with pasta, try playdough and blocks! Bricklaying for kids! -You could colour your pasta using this method. Adding in coloured pasta pieces will add a different artistic and creative element to the experience. - For this activity we used some stale and broken pasta pieces we found in the back of the pantry that may otherwise have been thrown away. After using pasta in our play, we store it to be re-used in other activities. If you have concerns about using food for play and learning, this article is a good read. - This engineering and architecture activity using toothpicks and mini-marshmallows is also a great one for kids interested in building and design.